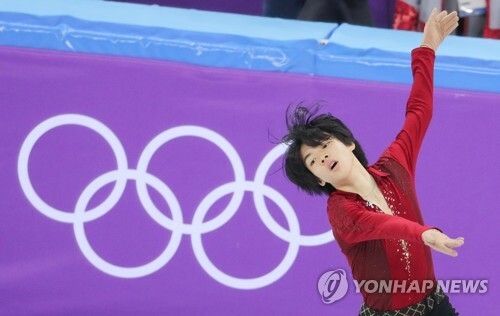 PYEONGCHANG, South Korea, Feb. 15 (Yonhap) — Rising figure skating star Cha Jun-hwan will make his first appearance in the individual competition at the PyeongChang Winter Olympics on Friday, a chance to measure himself against a who’s who of figure skating today. Cha will compete in the short program of the men’s singles event at Gangneung Ice Arena in Gangneung, host of all ice events just east of PyeongChang, starting at 10 a.m. Cha will be the 14th of 30 skaters to perform. The 16-year-old set a new personal best of 77.70 points in the short program during the team event last Friday. Cha had been battling flu heading into the competition, and his coach, Brian Orser, said he was quite satisfied with Cha’s performance. Orser, who famously coached South Korean icon Kim Yu-na to a gold medal at the 2010 Vancouver Winter Olympics, is working with other medal contenders in the men’s singles here: defending champion Yuzuru Hanyu of Japan and two-time world champion Javier Fernandez of Spain. Orser has said he expects Cha to finish around the top 12 this time, and the teenager could use his first Olympic experience as a stepping stone for the next Winter Games in Beijing four years later. Also on Friday, the South Korean men’s curling team will continue its round robin play at Gangneung Curling Centre. South Korea lost its first two games Wednesday: 11-7 to the United States and 7-2 to Sweden.